Here is how I knew we had a good thing going with our new pattern, Dahlia. After taking a slew of pictures in the studio with our beautiful model Amie a few weeks ago, we stepped outside to capture a few outdoor shots before the sun went down. As we were walking around for about forty minutes, Amie got no fewer than three (!) compliments from strangers on her plaid dress. To be honest, we originally conceived of Dahlia as a spring pattern. But schedules changed, projects were flipped around, and we realized that it would be the perfect dress for fall and winter too. I couldn’t help but imagine it in plaids and tweeds. Version 1 is the most obvious cold-weather option, with mid-length raglan sleeves and a barely flared skirt with small back kickpleat. So far, we’ve made it in wool flannel, raw silk (the emerald green version), rayon suiting (the plaid version), and wool tweed. All beautiful, warm, and great paired with thick tights and a sweater. Version two is sleeveless, and uses bias tape to form simple and easy straps. The skirt is cut in six gores, for a smoother but still gently flared shape. We made this sample in a beautifully drapey black rayon, finished with metallic gold trim. I think this version would make a fantastic holiday dress, but it would also be great for those of you in the southern hemisphere. It works just as well in cotton lawn, voile, seersucker, or linen. The other day, I was having lunch with a friend and we were discussing the fact that shapeless clothes are in fashion right now. I admit that I don’t mind the occasional shapeless dress. I like comfortable clothes, after all, and a dash of androgyny does tend to liven things up. But there is nothing quite like a pretty dress, one that’s designed to flatter curves and make you feel good about what you’ve got. When I said that I wanted to return to our roots, that’s what I had in mind – something pretty, ladylike, and most of all, classic. Dahlia has an inset waist yoke, which is one of my favorite ways to play up curves. This type of styling was common in the late 1930s and 1940s, and lasted through the 1960s. It’s a feature that’s difficult to find in modern dresses, but I find it to be universally flattering. The sleeves are cut in a raglan style, with a slightly loose fit that allows plenty of motion. Raglan sleeves have a diagonal seam from underarm to shoulder rather than a circular armhole with a set-in sleeve. In some ways, they are easier to sew and to adjust (no easing or sewing in the round! ), though the fit is a bit different. If you’re curious about sewing this type of sleeve, you’ll want to join the sewalong we have planned for next month. It will begin on November 3. I’m pretty keen to try some color blocking with this sleeve, myself. Without a doubt, my favorite versions of Dahlia so far have been the plaid ones we’ve made. We specifically planned the design lines of Dahlia to work with stripes of all kinds, from the raglan sleeve to the inset yoke to the use of gathers instead of darts in most places. If you want to try making either version of Dahlia in a plaid or stripe but are intimidated about matching, you’ll want to grab a copy of our little bonus pack on sewing it in striped fabric. There, I go over how to cut the pieces, plan your sewing, and match stripes and plaids throughout. 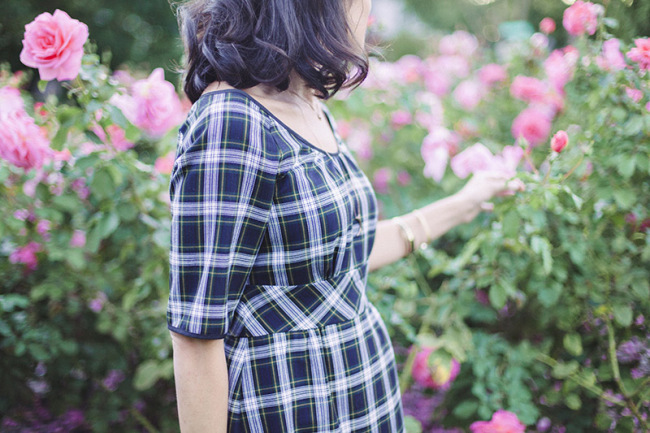 You’ll not only figure out how to sew this dress in plaid, I think you’ll come away with a better idea of the theory behind plaid matching for anything else you might want to sew. This information will also be posted in a tutorial on the blog next week, but if you want, you can download it now. When I showed Dahlia to a group of ladies from Modern Domestic (our local sewing studio) last weekend, our friend Lupine (co-owner of the shop) commented that she loved that there are no facings. Yes, facings are often necessary and sometimes make finishing easier, but often they are just too fussy. Both versions of Dahlia are finished with bias tape instead. If you’ve ever made our free Sorbetto pattern, you know that bias tape can be very easy to work with, faster to sew than a facing, and also really fun to make in different colors or patterns. But even if you don’t want to make it, there are a lot of fun options on the market these days. Now in French and English! One more piece of good news. We also have translated instructions for Dahlia in French, so if French is your preferred language, you can download the instructions and sew along more easily! Whether you buy the printed or digital pattern, you can download the French instructions from us either way. We’ll also be translating some of our other popular patterns into French and releasing those very soon. We’d love to translate into other languages as well, but we’re beginning with French because we have a great translator with sewing knowledge. Get 15% off, now through Friday! I’ve talked enough, so head on over to the shop and get Dahlia for 15% off through Friday! I can’t wait to see what you guys make. Love it! This is the dress pattern I’ve been looking for all year! Wow…I’ve not bought any of your patterns yet, this is one tempting. I love the green raw silk dress, and I didn’t think I’d ever want/need to make a plaid dress, but I might want to now. Very nice dress. If not for the fact that I have so many things I want to sew (including a corduroy Hawthorn), I would have snatched it up. I am very much looking forward to the sew along. I would really like to know a good way to do a narrow shoulder adjustment on raglan sleeves! My brain tells me those underarm seams need to be longer, but I’m really not sure how to tell how much. agreed! Tops tend to gape at the back neck and I’d love to see a mod covered in the sewalong. This is lovely! Possibly my favorite dress I’ve seen on this site. I would love to see some photos with a plus-sized model, as well – it looks like a style that would work well for larger women. I’m sure we’ll get some photos of it “in the wild” soon! yes! it looks lovely on the flat stomached model, but how will it look on those of us with a bit of a belly? any examples yet? I really like the slim but comfortable looking skirt and how it’s designed to work well with stripes and plaids! I am so excited that I grabbed this pattern during the sneak peek. I can’t wait to sew it up. I’m found a peridot colored silk that I think would be amazing for the sleeveless version. I love this! I haven’t bought anything in awhile but this is definitely a must buy for me. This dress is lovely! I bought the pattern yesterday. Thank you very much for the sneak peek discount and especially for the bonus pack help, I’ll need it. Would it be possible to how how to raise the neckline somewhat during the sewalong? I love the lines you’ve created, they’re beautiful and womanly. I just get cold easily and need a little more coverage. Either way, thank you again for a lovely design, and for the extra help in the bonus pack. Both are very much appreciated! I’ll mention it to Devon. It’s an extremely simple adjustment, because there’s no facing. You basically can just draw in the neckline you want and continue the line of the shoulder/raglan. Thank you very much! I have a plaid flannel in muted blues with raspberry pink and teal green accents that is patterned very much like your example. I originally bought it for a nightgown, but it was so pretty when it arrived I wanted to make it into a dress. Dahlia + stash=perfect! I’ll be making my dress with the sleeves and the gored skirt. Beautiful! For me, looks like I’d need to do a SBA (as I’ve had to do on 2 other Colette designs). Any plans on offering tips for that? Pretty please!? I believe Devon will cover bust adjustments in the sewalong! I adore this. I might say this might be in the same category of love as the Licorice dress, which I love love love. I have so much fabric in my stash that would look good in this, and I wish I could drop all my work this week and spend days sewing up Dahlias. Very nice! Thank you and congratulations! Adore this! I had to buy it immediately! I love it! I haven’t sewn anything in forever(it seems). This is going to be made in multiple fabrics – with sleeves & without! Beautiful! I love the plaid version! I’ve already printed the pattern and can’t wait to find the perfect fabric for it :) Thanks for the preview discount! I bought this immediately yesterday. I would have started on this project last night if I hadn’t gotten home so late. I adore the green dress and I love having two skirt options. I really like the dress with sleeves, however, I’m not sure if I like the gathering under the bust. pencil thin woman can wear! It is a beautiful dress, but I am uncertain it would work for me. I have a long torso and thick waist. Lovely dress! I love the built in ease in the bodice, with a fitted waistband. I can’t wait to make it! Thanks! I adore the raglan sleeves on this. It hits all the notes- flirty, tailored. Just magic! Love the raglan sleeves, the two skirt options, the scoop neckline…could I make it in a med-stretchy jersey knit? What do you think? I don’t know, I think it depends of the fabric. I often have to size down if I’m adjusting a woven pattern for knits. I DO think it would be fabulous in a stable knit like ponte, with a few adjustments. I’m hoping to try that out myself soon. Oh, I hope you’ll be posting the results and tips. I have so many (too many) nice ponte fabrics in my stash. I was so glad to discover it !!!! I bought it at once ! Thanks a lot for this pretty pattern…!!! I made one in a dove grey tweed wool, it’s amazing! I’d change them to darts. Removing them completely will probably cause the skirt to ride up when you sit, without the extra room for your tummy and backside. Another option would be a few stitched-down pleats. I’d do several on each side and keep them small if you don’t want any extra pouf. Will do, and thank you! I’ll take some pictures so you can see how it works. I love this dress, got the pattern as soon as the e-mail came through yesterday. Any suggestions on how to modify it for the bustier person??? I can do FBAs with darts but never thought how I’d do them with tucks! LOVELY!!! Dahlia looks elegant and feminine, can’t wait to make it……in March……after the baby pops out so I can fit into clothes again! Unless there is such thing as a full belly adjustment…. Can’t wait to see if this will THE dress! The simple neckline and fitted waist leave me hopeful that this pattern will provide some shape to someone like me, whose bust, waist, and hip measurements are all close to the same! I was so excited when you announced that the pattern was a return to Colette’s roots. My first pattern of yours was Macaron, and I fell in love with it for all the reasons you list: it’s feminine and vintagey and a delight to sew and wear. I’ve loved the new offerings–Hawthorne has become a favorite–but this dress! I swooned a little when I got the preview yesterday, and I purchased it immediately. I’m really looking forward to the sewalong, and I’d love to have a fabric round-up as well–in a brief, furtive search yesterday at work, I wasn’t able to find anything I liked to make this up in. The green silk and the plaid are both gorgeous, and I’d love to find something similar for myself. Good work, Colette. Keep it up. Of course I bought the pattern right away! I’d love to see a pic of the wool flannel one. The first thing I thought was of doing this in a heavier weight material and wearing it with knee high boots. I’ll post that one next week along with the plaid matching instructions! It’s a very light flannel that I used. I love the different versions of the dress flared or straight skirt, sleeves or no sleeves. I love the plaid dress. Can’t wait to make it probably in red. Ooh, red would be so pretty for the holidays! So glad I got the sneak peak! I saw this dress and knew it was PERFECT for a dear friend of mine. Minimal facings, beautiful details and a FULL RANGE OF SIZES – I am so excited to make this dress for her! This dress is adorable! I bought the pattern as soon as I saw the pictures yesterday. It was exciting to see something so cute that is high waisted enough to hack and make it suitable to work as maternity wear. Of course I can’t wait to make a standard version either. Lovely dress. I haven’t been able to sew all summer due to house projects, so I’m looking forward to making this my first sewing project this season. I’m looking forward to the sew-a-long and reading the bonus pack. I might get brave and try this in plaid. So very PNW. Wow, perfect dress! I have been looking for a dress with this silhouette, but could not find one that had both a bodice and skirt that fit. Now, I have a pattern (‘cuz I just placed my order) that I can adjust to my measurements. Yay! With fabric I have on hand too since the pattern doesn’t seem to require too much yardage – big plus. Yay! Thank you! I bought this immediately yesterday–and I NEVER do that! It’s that good. Funny thing was I was just going to post and ask if you would do a Laurel hack with raglans! This is even better! This dress is beautiful in every version! As a beginner, I’m happy that it doesn’t look too difficult either. I bought the pattern and can’t wait to make it! I am in love with this beautiful and versatile pattern! I think it will be perfect for the office with tights, boots, and a cardigan this winter. This dress is very lovely ! I’m French and I want to say Thank you for the french version !!! Superbe ! J’ai un joli coup de cœur pour cette robe ! I love this dress. It is so classic and there are so many options. I always buy your patterns because the instructions are so good that they are like a mini sewing class for me. I’ve improved my skills because of your fabulous instructions (and I’ve improved my wardrobe too)! I like the dress, it’s very pretty on the models. However, I’m not sure it’s going to be a good one for my figure. I’m very long waisted, and high waists with gathers tend to make people ask me when I’m due. (I’m not pregnant.) So I will skip this one, and look forward to the next one. Leigh, I don’t think you’ll have the problems with this because the bottom of the yoke sits at the true waist. I am TERRIBLE with empire waistlines (make me look either heavily pregnant or just fatter than I am) but the muslin of this looked great on my waist. I love the gathers under the bust line, and the versatility of the pattern. The use of different fabrics makes it a must have pattern. It’s lovely, looking forward to making several……the one thing that struck me though….pockets. I just have to have them! They are the best thing in the Rooibos dress. This is just lovely, but I have very square shoulders that don’t look good in raglan sleeves. My adult daughter has already commissioned me to make one for her. Just drop dead gorgeous! Well done!! I”ve gladly snapped up my preview copy yday! 1) will Devon be covering how to add a lining for view 1? 2) where did you get that stunning raw green silk for that view 1 sample? She doesn’t have it in her schedule of posts, but I asked her about it. We might either do it as part of the sewalong, or do a separate posts on linings here on the blog. oh lovely! Do you think a medium weight raw silk fabric like this one from Gorgeous Fabrics would work for View 1? The inset waist is such a lovely feature. I’m going to be curious how it looks on someone without much of a waist. I love the nod to the 60’s, but also, how timely this dress is for today. I think I’m going to try it in a cranberry gaberdine. I have flannel fabric I have been looking for the perfect dress pattern for. I think I found it! I’ve been looking for this pattern for years. Thank you for finally making it a reality! Love it will definitely buy it when it gets to the UK . I bought this as soon as I saw the email yesterday. I love it, such a beautiful and versatile dress. Now to find the perfect fabric, I am thinking a light wool for winter. SO excited for this design! I am fairly hourglass, so having the separate inset waist allows for easy adjustments. And I’m loving the fact that there is ease in the skirt, but the front is still smooth; it will be great for all my work travel. Also, this would be awesome colorblocked! I wholeheartedly agree that it’s time to get back to feminine curvy styles! I get easily sick of the boxy shapeless stuff out there, though as you said, it’s nice to be comfortable some of the time. I love Dahlia! It’s everything you say, flattering, versatile and feminine. Thank you for the uncomplicated pattern for the uncomplicated dress that I have been yearning for! PDF assembled and sizing cut out! I have to say, while this pattern is lovely, I’m disappointed. I was hoping for something a little more difficult and with the lovely unique features your older patterns featured. Will you be releasing any intermediate or advanced patterns again in the future? I learned well as a beginner from Colette patterns, but as I’ve become an advanced sewist I feel like I’ve moved beyond your current offerings. I know you are a small company and I love the work you do for people new to sewing, but it would be great to see more skilled options. That’s exactly what I was thinking when I saw this. Lovely. But not very interesting. Bought it yesterday during the sneak peek – absolutely lovely pattern. Can’t wait to get my copy and make up a version. So glad that this pattern is for wovens and goes back to the old aesthetic. I love it! It has the femininity and lovely details of your earlier patterns but is a little bit less of a party dress, so it’s easier to imagine wearing it to work. Thank you! Love it. Classic and modern at once. I have visions of navy blue micro dot, classic black and even a sophisticated floral. Can’t wait to get started! OK, I resisted for a while and then you got me! I have the admit the green version is just stunning!!! I will probably lower the waist a little as I am a 34D and I really want this beautiful waist inset to be close to my waist and not jusu under my breast. This would make me look pregnant… Hope I can make it work out. Anyways, thanks so much for this pattern ! You rock! Absolutely love it, when is got the email yesterday I didn’t even hesitate, it’s a beautiful shape, I’m really looking forward to making it! Thank you for the discount too. Hi ! Liked your Dahlia pattern but couldn’t buy the French version at 20 % off yesterday, so didn’t buy it at all. Too bad ! I absolutely LOVE this dress! Classic, figure flattering with an inset waist and raglan sleeves? Yes, please! I bought mine yesterday. I actually used to check pattern books every season for inset waist patterns – you’re not kidding about them being hard to find. And even when I found them, sometimes the bodice and skirt were terrible. But I literally love everything about the Dahlia. And I love that gorgeous raw silk! I need to find a good online source for something similar. Yum! Beautiful dress, looks very flattering. My lifestyle now doesn’t call for many dresses, so I may wait a while to purchase. But i might be tempted..
Oh, I just LOVE this new dress pattern, Sarai! I can’t wait to get one and make it up – I’ve got to finish some works-in-progress before I can let myself get my head turned by a new pattern, but I love the under-bust gathers and the inset waist and I’ll definitely be ordering a copy of this pattern soon! I’m also excited to read your thoughts on going back to Colette’s roots with a more feminine look; I’ve actually noticed lately that I’m wanting to go a similar direction in my own wardrobe. I just don’t like the way loose, flowing stuff looks on me; I like a bit of waist definition, I like a sharp lapel, and a fit-and-flare silhouette. And your patterns are a perfect fit for my bust, which is hard to find. Thank you for all the beautiful patterns you’ve created over the years; and here’s to many more (I hope!). I think this is adorable. Thanks for extending the sale too! This looks lovely from the front but I noticed there are no photos or videos posted of the back of the dress. I would need to see the back before making a decision to purchase. I know the inset waist will be a challenge for me because my waist is short, but I like the raglan sleeves and the skirt shape. Ready to try my first Collette pattern. I love this pattern! I have been reading your comments on how to make this work for us curvy gals,and I think I am going to make it out of knit, so it will be cozy to wear in Seattle’s rainy wintry season! I’m excited to make this- and tinker with adjusting it to be a winter maternity dress. I’ve got a few ideas on how to do this, but I’d love to hear if anyone has any pointers! A brilliant return to form with this dress, I have some purple plaid that I planned to use for a 2444/ peony mash up but will definitely be saving it for a Dahlia. Looking forward to seeing some versions popping up around the blogosphere. I am so excited to make this pattern! I snatched it up during the preview yesterday, and that’s something I never do. There are so many things you can do with this dress, I’m planning on making one that looks like a separate skirt and top for work. Thank you very much for the sneak peek discount………. I read about the bonus pack; is it included w/ the pattern or accessed some other way? Thanks so much……..one still not so savvy computer operator here. I am so excited about this pattern and nabbed it up yesterday during the sneak peek. I have some plaid fabric, that I bought at Bolt Fabrics when I was last in Portland, that would be perfect for this. This will be my first time sewing with a plaid fabric, so it totally sealed the deal when I read that there was a download about sewing plaids to go with this. I have some fabric for a plaid Negroni, that I have been wanting to sew up for my hubby, so this will be great practice. Thanks and great job! I love it. 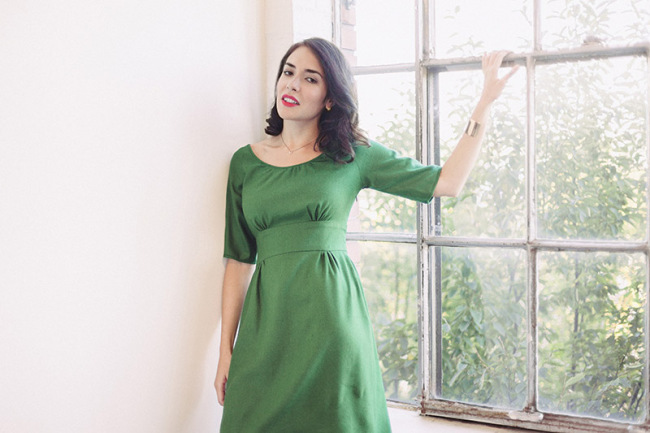 I haven’t made a dress in years and Dahlia is just perfect to tempt to sew a dress. Will you be offering a discount to UK buyers. I’d like a pattern rather than PDF. What a great dress. Like both: with sleeve and sleeveless. I love the raglan sleeve: it makes it very comfortable to wear, but the waist yoke makes it very feminine. 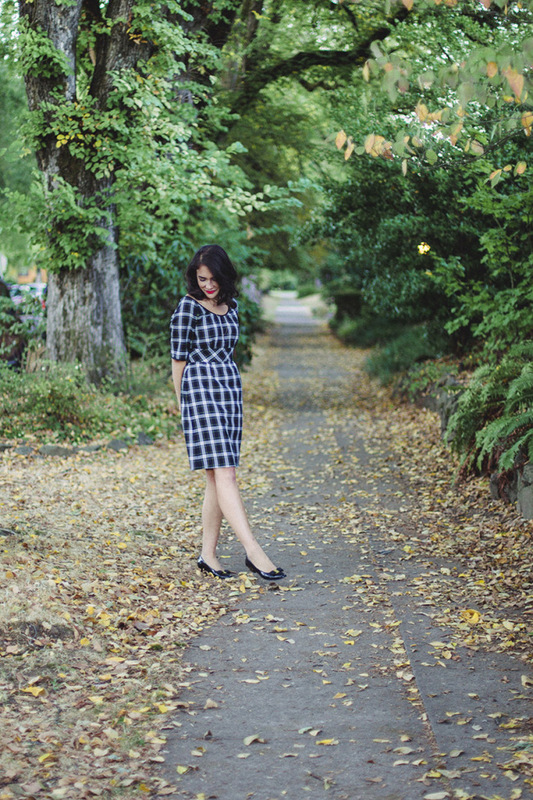 The plaid dress is my favorite: this is most likely going to be my X-mas dress. You have outdone yourself! Since I live in the WI northwoods and winter is biting at my boot-clad heels, I will be stitching the Dahlia in a lovely wool. I plan to line mine so it will be easier to wear. Will be looking forward to the sew- along. Thank you for your hard work and creative team. Treat yourself to a steamy hot cocoa and warm apple pie. Oh, I love it. So beautiful, so… womanly. And so … soft! I really love how it softly accentuates the curves, without being too tight. My favourite version is the green one, but I’d love to see the other versions you made, especiall the tweed one! Brought this as soon as I got my sneak peak email. It looks lovely and I cant wait for the sewalong as I am new to sewing. I am not sure what fabric I will get and is there a way to make the summery version with wider straps so I can hide my big bra straps. Would this pattern be easy to adjust for pregnant women?